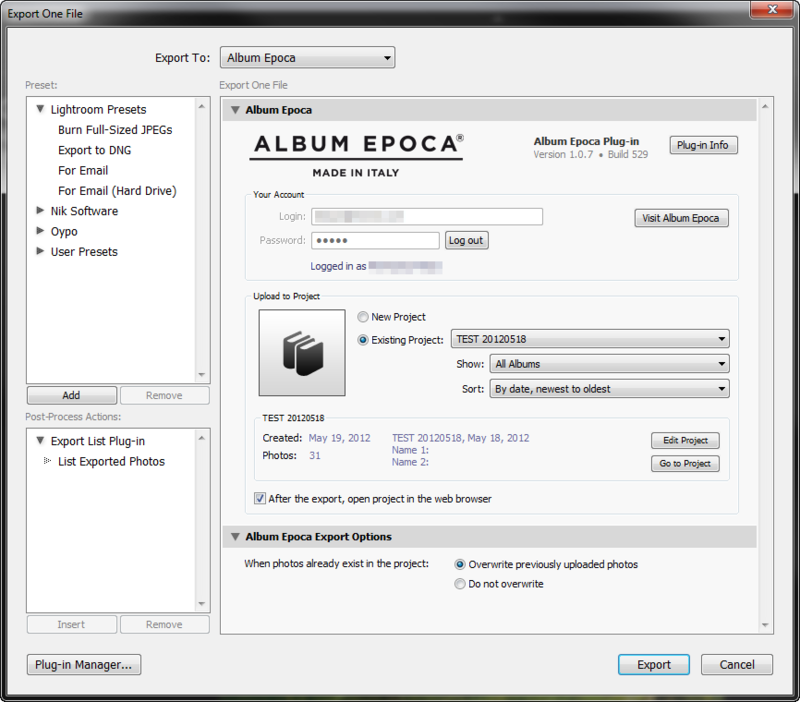 The Album Epoca Plug-in allows you to export photos from Adobe Lightroom directly to the Album Epoca Service. 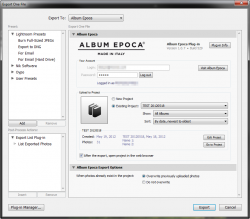 The development of this plug-in is being sponsored by the Album Epoca Service (www.albumepoca.com). Improved validation of project properties - project name, event date, etc. Fixed the "assertion failed!" error when the project's event date is specified in a wrong format. Tested and confirmed for compatibility with Lightroom 5. Fixed some issues with Italian translations. Fixed the "System.Exception Filename exists" error in some cases. Now when the user name or password are entered incorrectly the plugin gives an intelligent message instead of a system exception. Minor layout fixes in the Export Dialog. Tested and confirmed for compatibility with Lightroom 4.1 and 4.2. Fixed the issue with not retrieving existing projects when there is only one project in the account. Fixed the issue with security token expiration. Fixed the error when there are no projects in the accounts. Fixed several issues with Spanish and Italian localization.